Detroit Restaurant Week returns September 19th - 28th for Fall 2014. 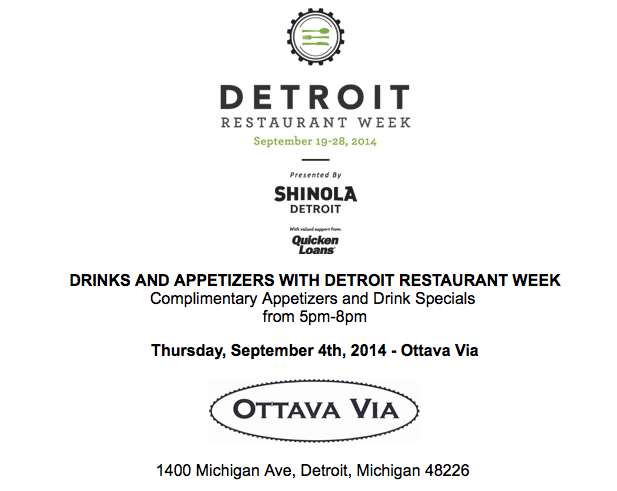 Leading up to the Fall Detroit Restaurant Week is the first "Drinks & Appetizers with DRW" happy hour event- a fantastic evening of complimentary appetizers, unbeatable drink specials and lively conversation on Thursday, September 4th at Ottova Via. Visit www.DetroitRestaurantWeek.com for the latest updates about menus and upcoming events.